At the heart of aikido is the concept of ‘ki’ or one’s ‘life-force’. Aikido training seeks to fuse universal ki which flows within each individual. Aikido translates as “the Way of harmonious spirit”, and like other budo arts seeks for the unification of technique, body, and mind. The way one holds his or her heart in aikido lies at the root of ai-ki (harmony with ki), which is, according to Ueshiba Morihei (the Founder of aikido), “love”. Budo literally means “martial way”. 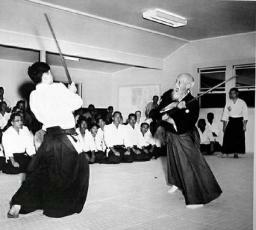 As aikido is a budo art, the techniques utilized derive from combat systems created by warriors in Japan’s feudal age. However, Morihei’s philosophy was to combine the techniques with the spirit of heaven and earth, thus creating a ‘Way’ for training body and mind with unreserved love for all things. The “love” in ai-ki seeks to nullify the ego and one’s intrinsic traits of insincerity as a path of absolution and self-cultivation. The techniques require discipline, and serve as a medium for the ongoing journey to unite body and mind through channeling the “laws of heaven”. “The primary objective is not the perfection of the techniques per se, but developing one’s character and humanity in accordance with the natural laws of the universe. 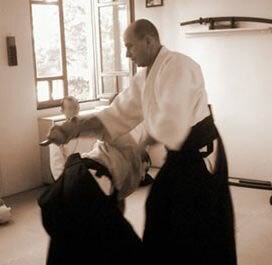 Through years of austere training in aikido, the practitioner is able to cultivate an inner-strength and energy which is expressed gently in his or her external techniques and demeanour. All movements in nature are economical and rational and retain a fixed center. The principle of the “stable center” is inherent in all things, and practitioners strive to align their centers with that of nature. This concept is evident in the distinctive aikido movements, which are perfectly centered, are flowing and circular in motion. The rotational movement seen in aikido is what enables the utilization of energy to defend against arracks regardless of the opponent’s size or strength. lt is the gentleness of aikido’s techniques and movements that make it attractive to people of all ages and nationalities. Source: Nippon Budokan (2009) BUDO, The Martial Ways of Japan, Japan.